I've been unwell for the last two weeks but am now getting back to normal - almost - so this post covers some new colours (eight) just introduced by Daniel Smith. With two exceptions they are convenience colours mixed from two or more pigments. 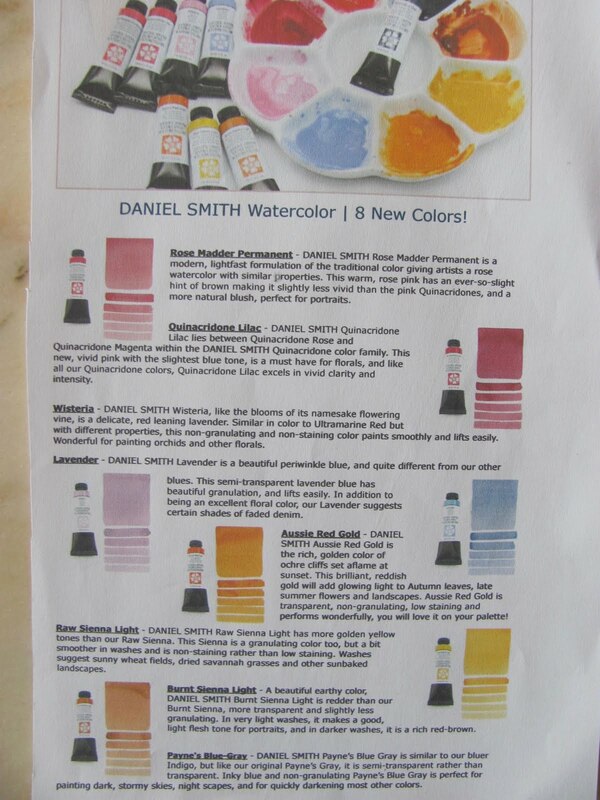 With Daniel Smith now offering north of 250 paints one wonders where it will all end? Most artists palettes range from as few as 6 to 24, although there are always exceptions, so how do you choose? The danger is that you buy far too many and those least used dry up in the tubes, with some pigments more prone to do this than others. I had this experience with Quinacridone Purple (PR255), which solidified into a cement like mass and couldn't be squeezed from the tube. Several £'s worth of paint junked! I have another issue with Daniel Smith that I'll relate later. I have consulted both Handprint and the pigment database over the pigments used but otherwise the conclusions are my own. Rose Madder Permanent - ".....a modern , lightfast formulation of the traditional colour....". This is a three pigment mix of PR209, a red, PV19 a rose or violet shade and another red PR202. Quinacridone Lilac (PR122). "... lies between Quinacridone Rose and Quinacridone Magenta within the Daniel Smith Quinacridone color family...." Most other sources call this Quinacridone Magenta but it would seem there are many versions of PR122 available from pigment suppliers, Some are transparent and some more opaque. The pigment database says artists paints are mostly the transparent ones but some makers may well use the opaque versions. Handprint quotes the 1999 ASTM ratings of only 'fair' in watercolour - this refers to lightfastness, in other words whether the paint is likely to fade over time. Handprints test put it in the "excellent" category but cautions that the best rule is to treat all crimson and rose pigments with suspicion. Handprint also prefers PV19 Quinacridone Rose. Wisteria. (PW6, PR122)"....like the blooms of it's namesake flowering vine....". This is PR122 , here recommended for painting florals. Lavender. (PW6, PR122) "...a beautiful periwinkle blue, and quite different from our other blues...."
Aussie Red Gold (PY83, PR101, PV19) "....the rich , golden colour of ochre cliffs set aflame at sunset...." Another three pigment mix. Burnt Sienna Light. 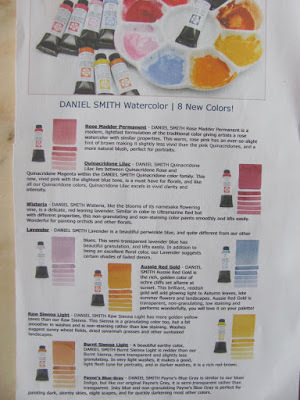 - ((PR101, PO48)...."A beautiful earthy colour Daniel Smith Burnt Sienna Light is redder than our Burnt Sienna, more transparent and slightly less granulation..."
Paynes's Blue-Gray. (PB60, PBk6). "...similar to our bluey Indigo....... Do we need another Paynes Gray, one of the easiest shades to mix? Well there you are. I don't like paints where white has been added. This seems to be happening more and more. In my experience it tends to make the paint cloudy when diluted and also - at least in some formulations - the paint solidifies. Why do we need more and more colours? Daniel Smith is now something like 250 and still rising. When can you have too much of a good thing? I have the 'Paint it' sheets - 238 colours I think - and can't help thinking many colours are very similar. They have some wonderful paints without a doubt but how big a palette should you actually have? I've bought a number and some are gathering dust as I can't see how to incorporate them in paintings I actually do. Paints for most amateurs? I think not. 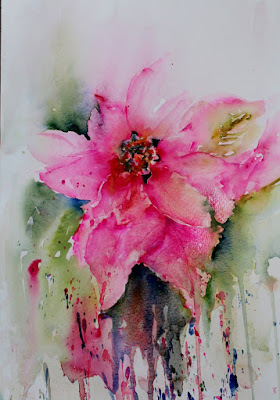 Yvonne Harry, our group leader at Avon Valley Artists, is a flower painter par excellence, and thinks some of those above look lovely. She is on the DS mailing list and gets the regular e -mails they send out. I'm not, is this because I e-mailed (twice) about their claims regarding the Cadmium Hue equivalents, all mixed pigments, which they claim behave like single pigment paints when mixed with others. I'm still awaiting a reply. I've now severely restricted my purchases of DS paints as they are so expensive in the UK. There are plenty of other good makes that are perfectly adequate, and at lower prices. Daniel Smith have certainly shaken the watercolour world since they were introduced and must be giving headaches to the likes of Winsor & Newton. They are fabulous paints but you need a very deep pocket to major on them. Watercolour Paintings 26 - Welcome to 2017! To commence 2017 here we go! A mix of well-known and lesser known artists. A range of styles, subjects and contrasts in the use of colour. What more could you want? Cornelius Dragan-Targo Viste - Venice ? All these artists appear on Facebook in one form or another so should not be too difficult to locate.